I recently got a used Tenori-on without the MIDI cable. They use a mini-DIN to fan out to dual MIDI females (in and out). The Tenori-on store doesn't sell them and I can't seem to find them anywhere on the net. And nobody who seems to own one has ever posted the pinout on the Tenori-on forums - even though there seems to be a fairly big need for it. I met a gent on the net who sent a old cable of his to me but it seems to have gotten lost in the post (or mail from Europe to the US takes a very long time- which may be the case) so in the meantime can someone who owns a cable PLEASE send me a pinout of the thing? The box has some cute sounds but my rig wants to be controlled by it! If you email or call the Tenori-on distributer in Santa Cruz, they will send you one, maybe for free. I was in the same boat. I managed to get a copy of the schematic and pinout from Yamaha. I sent it to James and am posting it here for posterity and with the permission of Yamaha. Isn't it the same MIDI-cable as for the SW1000XG? If someone is making cables, please PM me. Did you find a midi cable yet Ritchie? I am asking as I recently sold a Tenori-On and the new owner is also looking for one. Why are these cables so rare? It seems if someone did a short run of 50 or so they would sell no problem. Ah cheers Paranormal Patroler I will pass this onto the new owner. would a single bi-directional Tnr/USB midi cable be possible? Since the Tenori-On doesn't use USB at all I doubt that would be possible. The connector at the TO end is a S-video style connector, the other end is two standard 5-pin din connectors. No need for a host computer. 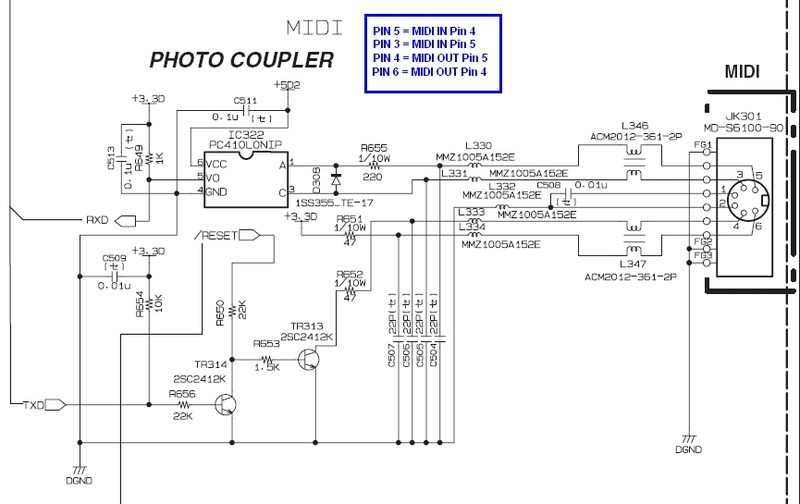 You of course can wire the DIN ends to be whatever kind of a connection you want to your MIDI interface, but it still comes out as two separate MIDI paths, an In and an Out. so, how is midi over USB different from old fashioned DIN midi (other than being bi-directional)? thanks, even I could understand your explanation. Bloody BRILLIANT to have this pic available for future need!!! I just bought a second hand Tenori-on. It came with a DIY midi cable that didn't work because they had swapped pin 4 and 5 on both in and out connectors. I swapped them back and it works fine now. My cable has neither of the shields (the middle pin on the in and out) connected and it still works. According to the midi spec you shouldn't connect pin 2 (shield connection) on the midi in anyway. Bought a Tenori-On today, midi cable is still missing ... but the previous owner will still look for it (lots of things misplaced when moving). Now I should download the manual for easy searching on the PC, and the latest firmware as it's still 1.0 if I saw that correctly. Upgraded to V2.1, looked for an audio cable ... and also found a fitting midi cable. Which in my case can only come from the SW1000XG, as mentioned in a previous post. Thankfully I never had an issue with my TO cables yet. I do think ritchiedrums had a couple for sale so you can ask him if those are still available. Maybe I should buy two myself just in case. Still available huh? I definitely need to buy a few. Thanks! Thank you, this is super useful! The new Yamaha Reface series appear to use exactly the same Midi cable.. It certainly looks identical anyway.